Nestled just two hours up the 101 North from the Golden Gate Bridge lies Mendocino County. Time seems to slow down when you drive along the Russian River, through the Vineyard Fields, and onto the Redwood Tree Forests. Most people think of the coastal city when they hear “Mendocino” but Mendocino County is made up of 3,878 square miles of beautiful scenery. Spending a day in Mendocino County can be as relaxing or adventurous as you please. With the inland, coastline, forest, and in-town, there lies opportunities for everyone. A full day can be spent exploring the coast, enjoying the beautiful oceans that Mendocino has to offer, or even exploring the redwoods and their glory. 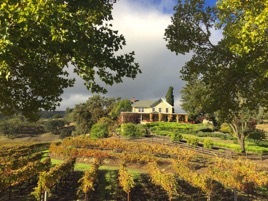 Another great way to see the beauty that Mendocino County has to offer is spending a day or even a weekend in the inland areas of Hopland to Leggett. Next on the list, is a stop at Vichy Hot Springs located in Ukiah, CA. While a full day could be spent at this relaxing location, you can also cut down your time here to an hour or two. The hot springs have many health benefits that date back to 5,000 years ago and more. Take a moment to unplug and destress at Vichy Hot Springs before continuing the rest of your day. After some R&R, grab a bite to eat at The Bottle Shop Deli which has some of the best sandwiches in town. While you are there can you stock up on snacks as well as refill your gas tank. Once you finish your lunch, head on over to Parducci and go wine tasting or even tour their winery. The tasting room overlooks the vineyard and the Mayacamas Mountain Range. Parducci is open Wednesday- Sunday from 11am-5:30pm. After wine tasting at Parducci drive six minutes to Testa Vineyards to enjoy the family owned and operated property. While you’re there, be sure to stop by the tasting room to enjoy their wine while taking in the views their property has to offer. Testa Vineyards is family friendly and even better, it is pet friendly! And, if you need a place to stay, Testa has a ranch house that is available for booking. If wine tasting isn’t your thing, make sure to stop at Montgomery Woods to hike some amazing trails and witness the huge redwoods in person. If you have time to spare, Lake Mendocino has breathtaking hikes and you can even go boating. There are tons of tasting rooms located in close proximity to one another along HWY 101 N, try to stop at as many as possible because you don’t want to miss out on the views and delicious wine.